The Cafe manager says “The cafe finds itself situated in a beautiful church. It is a place where people can come for refreshments 7 days a week! Monday to Saturday in the cafe and on a Sunday for church. We provide a warm welcome and aim to get to know all our regulars. I love how some of our team have journeyed alongside customers, to see prayerful support and kindness within our cafe community. 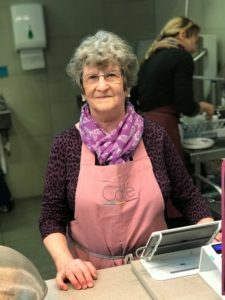 The cafe has an amazing team of volunteers, who provide a friendly and enthusiastic service. It is a great place for volunteers to use their gifts, share their compassion and meet new people. 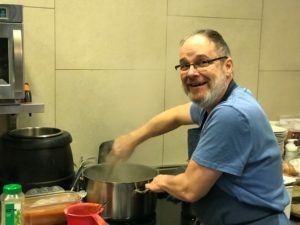 Some volunteers have discovered more of who they are, experiencing great personal growth and have confidently moved into new things after being with us.